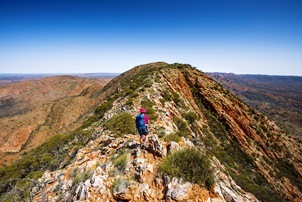 The Super 6 Day Larapinta Trail trek offers walkers the chance to really challenge themselves tackling the six hardest (and most spectacular) sections of the Larapinta Trail. 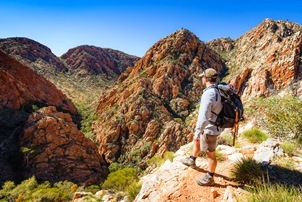 The rewards for taking on this challenging and varied trek are immense, with all of the most spectacular views of the Larapinta Trail on offer – high ridgelines, open savannah country, sheltered gorges and magnificent mountains, along with the best examples of the West MacDonnell’s vegetation. This is not a trek for the faint hearted or inexperienced as each day’s walk is rated hard or very hard by NT Parks and Wildlife. On each section you will be tested and rewarded until the final section: a hike to the highest point on the trail, Mount Sonder. It is a beautiful and poignant close to six days of superb trekking on the Larapinta Trail. 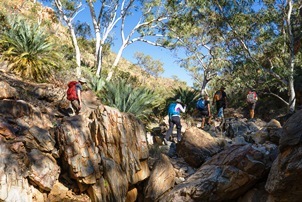 The Super 6 Day Larapinta Trail trek is for experienced hikers seeking a spectacular challenge. It is particularly popular with trekkers having limited time, however still wishing to experience the true remoteness and most spectacular parts of the Larapinta Trail that would normally only be explored on the longer 16 day End to End trek. The trek involves challenging to very challenging walking of between 7 to 12 hours each day, across very rocky terrain and ridgelines, with steep ascents and descents. For each day’s hike on this rugged world class track, you carry just a day pack. We create these trips to be an informative experience as well as a walk through the unique terrain, as we seek to share our knowledge of the place and provide all you need to have an active yet comfortable holiday. You walk with a guide for the day’s trek, with the support guide collecting and transferring you to camp each day, where you can relax while Trek Larapinta caters for your needs. Being a small, boutique business, we remain keenly aware that we rely on the health of our environment. It sustains us and we, in turn, seek to sustain it. 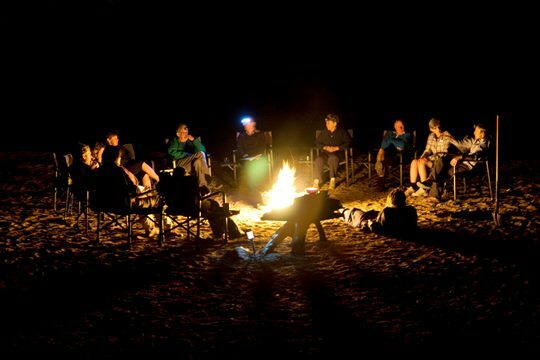 On the Super 6 Day Larapinta Trail trek campsites will vary throughout the trip, in different remote bush locations. Staying in a mix of our own private eco-camps and other remote bushcamping locations will provide a true wilderness experience. Travelling with us, you know you’re coming with a boutique business that specialises in the Larapinta Trail. The experience of being in this ancient landscape can be powerful and refreshing. 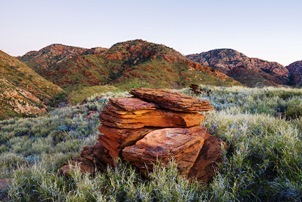 By offering fully-supported camping and interpretive guiding, Trek Larapinta aims to facilitate this experience for you. All the organisation, transport, food preparation, camping and catering equipment and other logistics are taken care of for you, so you can connect with this landscape in a calm, relaxed way and get the most out of your holiday in this amazing part of Australia. All camping equipment including sleeping bag, swag, pillow, bed linen and top of the range spacious tent. 5 breakfasts, 6 lunches, 5 dinners. Transportation provided in commercially registered, expertly maintained tour vehicles. All camping, traditional owner and national park fees. Group first aid and emergency communication facilities. 2 Trek Larapinta professional wilderness guides. Travelling with a culturally and environmentally responsible business. Small group with a maximum of 8 participants. Tours do not include pre or post trip airfares or accommodation. Detailed maps of the Larapinta Trail are also available for purchase. The Super 6 day trek requires a high level of bushwalking/walking and general fitness. 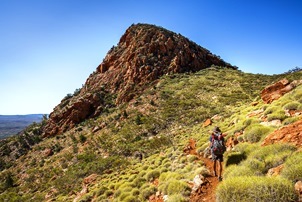 As the Larapinta Trail becomes more popular the perception of its difficulty decreases. This however is not the case. The trail remains unrelentingly rocky and hard underfoot and weather extremes can be experienced at any time of the year, so the more prepared you are the more you will enjoy the experience. Days vary between 7 and 12 hours of challenging to very challenging walking, depending on the section. The climb up and down Mt Sonder is a challenging 16km return with a 750m rise in elevation. Section 9 is a very challenging day covering a rocky distance of 29km including some steep ascents and descents. If you engage in at least one to two hours of aerobic activity (this might include walking, cycling, swimming etc) three to four times a week during the three months prior to your trip, you should find yourself fit enough to enjoy your days’ activities. Longer walks on uneven bush tracks with your day pack, including some ascents/descents (if you can find them) will help you prepare your body for the full days on the trail. Further information about preparation can be found at Trek Gradings and our FAQ section . A huge thank you to Trek Larapinta for another amazing adventure through the West Macs. It's been a week now that we've woken to the sounds of the iPhone rather than the dingo howl and our whole group has missed that along with the magnificent location and the quiet offered by our recent getaway. From the initial contact and organisation, all the communication about itineraries, gear lists and questions (thanks Clare) right through the trek itself, this is a company that sets and meets a high standard. A huge thanks to Sharna and Cal who were our guides for this trip. Their knowledge of the area, their care for all of us and their awesome cooking kept us going on our Super Six trip. For my partner and I, this was our second trip with Trek Larapinta and it was simply incredible, just like the first one. Thank you again for such a special week. 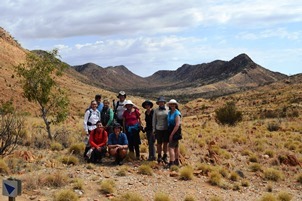 Our party of 8 completed the super 6 day Larapinta trek in May and we would really recommend it to a fit party. It really picks the best sections of the Larapinta trail. The scenery was spectacular: high stony ridges where the bones of the ancient landscape poked through the spinifex and deep gorges with polished rocks and unexpected waterholes. Wonderful country. Our guides, Kate and Nathan were knowledgeable and accommodating and provided delicious meals at day’s end as well revealing the secrets of the landscape and the flora and fauna. The equipment provided was high quality and the organization was flawless. Top marks to Trek Larapinta. We have just completed the super six Larapinta tour which we all thoroughly enjoyed. Our fabulous guides Eve and Sharna were more then equipped to lead us on our outback adventure. We agree that a reasonably high level of fitness is required. The standard of the food was very high as were the swags and tents that we slept in. All of our requests were met positively by Eve and Sharna and we thoroughly enjoyed their company. We would definitely book another tour with Trek Tours. A trek to remember My sister & I completed trek larapinta's super 6 trek in August last year and have not stopped raving about it since we got back. It will be a stand out hike for many years to come. In my opinion, a guided hike is the only way to experience a really enjoyable as well as challenging hiking holiday. Trek Larapinta were fabulous. Everything was taken care of. The food was yummy & plentiful. Our 2 guides were young but very knowledgeable and experienced. They provided good information about the local area, the indigenous heritage & were fun & friendly. I especially liked the way they also provided good education about hydration (important with the hot weather we experienced) & blister management that made for an issues free trip. I would highly recommend this company. The outback experience & terrain was truly magnificent. 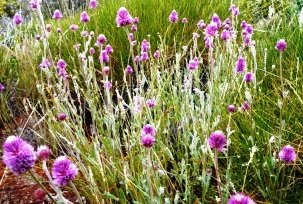 Every day we were surrounded by brilliant blue sky, rich red rock, and the stunning colours of wild flowers in bloom. Every night we looked up to a sky lit up by thousands of stars. This was a hard hike & not for those who don't have a high level of fitness. Fortunately our group did & it was a group that clicked well. The new friendships & commraderie added to the trip, making a once in a lifetime adventure. I wish I turn back time and do it all again. Thank you Trek Larapinta for making it so special. We have just completed the Super 6 Day Larapinta Trek with Trek Larapinta and it exceeded all expectations! We expected beautiful scenery, but weren't quite prepared for the scale and just how breathtaking the West Macdonnell Ranges actually are! The trek turned out to be about much more than the scenery. Our guides, Kate and Rob, are experts and an asset to Trek Larapinta. They are very knowledgeable about the geology, flora and fauna of the area and their enthusiasm for sharing the Larapinta with others was inspiring. An added bonus was their superb cooking skills. The fresh, wholesome and extremely yummy food was much appreciated! There were many other highlights; from our fellow trekkers who became firm friends, campfire chats, sleeping under the stars in a swag, very refreshing swims in Birthday Waterhole and the Finke River, to challenging but enjoyable walking. Loved the rock hopping in the gorges! The NT Parks trail builders who constructed all the rock stairs on the slopes are to be commended. We have no hesitation in recommending Trek Larapinta and hope we can join another Trek Australia tour soon! We ate like Kings, slept like Queens and walked across the most beautiful country. Thank you Kate and Kenna for a brilliant 'Super 6 Day Trek' through the stunning Larapinta trail, it was epic!! Having completed our trek on Friday I am now in the reflection stage! EVERY aspect far surpassed my expectations and I can hardly wait to use this same tour company again. The scenery was magnificent, the degree of difficulty was challenging and our guides, Sean and Wazza....well, second to none. It has all been said before in many reviews but this is a tour waiting for fit, enthusiastic walkers to experience. Congratulations must also go to Parks NT and especially to the Tasmanian track team who have made many parts of the Larapinta far easier to traverse. Love those solid steps! Sincere thanks to Trek Larapinta ; I will be singing your praise for a very long time. My partner and I recently did the Super 6 tour through Trek Larapinta. Our guides were Jacob & Ben and they were awesome! We had a lovely small group, hiked some of the best sections of the Larapinta, ate incredibly well and slept so comfortably. Having previously done some sections of the Larapinta independently, we decided to book a tour as a bit of a treat and also gain the confidence to tackle some of the harder sections. Jacob was such a great guide - patient, informative and personable. We felt safe at all times. Ben is a wonder chef!! His camp oven meals are better than what you eat in most restaurants! On top of this, we were woken each morning to the boys playing violin and guitar. Waking up in a swag, in a river bed, in the West Macs listening to beautiful live music is just ridiculously good. This was a once in a lifetime experience for us. The expense of the trip was a really big factor in our decision to do it and we nearly did not book it. We're so glad we did, it was worth every cent! I just participated in the most exciting trek experience of my life! Trek Larapinta have just added a new package called "The Super Six." As the first group participating on this expedition we expected a few kinks along the way. However we were pleasantly surprised when tour guides Ben, Kate and Shaun picked us up from the hotel and immediately made us felt welcomed and well looked after. Unlike the other 6 day option, the super six includes the 6 most difficult sections of the Larapinta trail. While the walk is very challenging, it provides stunning landscapes, geology, plants and wildlife. The guides have expert knowledge in all these areas and provide great commentary along the trail. We camped at private camp sites along the trail under the stars and full moon in comfortable swags. Both Ben and Kate cooked amazing meals in camp ovens including cannelloni, risotto, kangaroo and curries (not to mention the top notch desserts that followed). I would recommend Trek Larapinta to anyone wanting to experience the best of the red centre. At Trek Larapinta we strongly believe in the value of travel insurance. We want to help make insurance more affordable by offering you a 10% discount. Use this discount for Trek Larapinta treks and other travel you do anywhere in the world.